There's certainly no shortage of drama in the Rocky movie franchise, with each installment in the series coming with their own depressing moments. Still, one of the saddest chapters in the movie saga came in Rocky IV when Apollo Creed (Carl Weathers) dies in the middle of a fight. Having appeared in all three prior movies, Apollo had made the transition from a full-fledged foe into a total ally for Rocky Balboa (Sylvester Stallone). As the character had become one of the most beloved characters in the franchise, Apollo's death felt like a punch in the gut for viewers. Now, in a birthday post on Instagram addressed to Weathers, Stallone is admitting that he feels regret over writing the character's death into the story. "HAPPY BIRTHDAY to Carl Weathers! Your performances were amazing! Besides being a great actor he is the BEST cinema boxer of ALL TIME! Truly amazing, GRACE, POWER, and UNBELIEVABLY FAST!!!!! Never ever to be duplicated! Thank you my friend, never could have done it without you!!! I have to admit I regret having Apollo passing away so soon. He was irreplaceable." In the 1985 sequel, Creed challenges Soviet boxer Ivan Drago (Dolph Lundgren) to a fight. Although reluctant, Rocky agrees to help train Creed for the bout. During the match, Drago gets the upper hand, but Creed pleads with Rocky to not throw in the towel "no matter what." 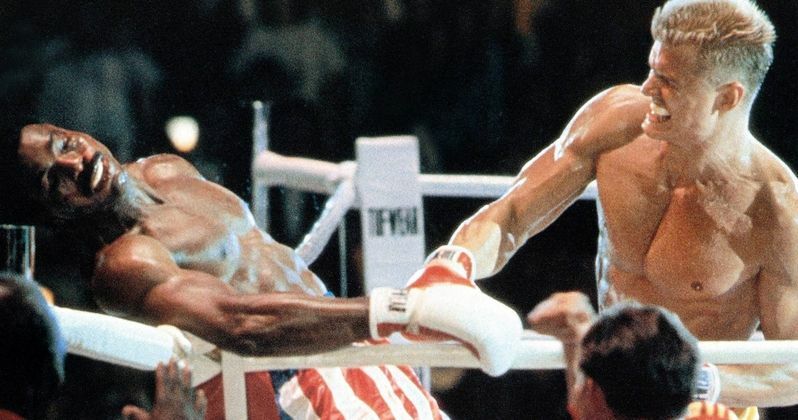 Because Rocky honors this request, Drago beats Apollo Creed to death in the ring, causing fatal damage with a hard-hitting flurry of punches. Making matters worse, Drago shows no remorse over Creed's death, infamously uttering the phrase, "If he dies, he dies." A truly heartbreaking moment, the scene sets the stage for the feud between Rocky and Drago which culminates at the end of the movie. While Sylvester Stallone may now be questioning the decision to kill Apollo, the creative choice may have been for the best. The character's presence wasn't exactly needed for Rocky V or Rocky Balboa, as those sequels took place long after the Italian Stallion's retirement. His death also opened the door for the spinoff movie Creed and its sequel, which follow the boxing career of Apollo's son Adonis. Both movies have been very well-received with critics and have been tremendously profitable at the box office, and a third installment is very likely to happen. It would have certainly been interesting to see Weathers involved in the movies, but it probably makes for a better story to have Rocky taking on the role training Adonis. While the Creed movies will continue in a franchise of their own, there's no guarantee we'll be seeing Stallone appear as Rocky. The actor has previously suggested that he is finished portraying the character, with nothing else left for him to add to the role. Even so, a strong enough script for Creed 3 with a good idea for Rocky may convince Stallone to step into the part at least one more time. With or without Stallone, however, the spinoff franchise will likely do just as well with new lead actor Michael B. Jordan. Creed 3 has not officially begun production, but it seems inevitable that another sequel will happen. Even though Apollo may have died decades ago, his character's legacy will continue to live on thanks to the prowess of his son in the ring. Stallone might regret killing Apollo, but he should definitely be happy about where the franchise has been able to take the story since. You can take a look at Sylvetser Stallone's Instagram post below. Creed 2 Story Inspired by Rocky 4, Will Ivan Drago Return?